Does it seem as though you’ve been forgetting things recently? Are you worried that you might be developing early signs of dementia? If so, then you are not alone. More than 50% of people over the age of 60 are concerned about memory loss. Some age-related memory loss is inevitable, but memory loss can also be a symptom of more serious conditions, including Alzheimer’s disease. It is a truism of marketing that fear “sells.” Given the devastating effects of dementia, there is a ready market for online memory tests and training programs, and many companies have targeted it. But do these tests and programs actually work? Or are people pinning their hopes on unproven products that may falsely reassure them and delay them from visiting their physicians? An appropriate test must correctly identify all of the people who have symptoms that may be of concern and encourage them to visit their physicians; however, it must also reassure the majority of people who may have concerns, but not actually have any unusual symptoms. How can you know that a test succeeds in this endeavour? There is only one way: you must perform clinical trials. Cogniciti recently released a clinically validated test that has proven to be very popular. In its first week it received 37,000 site visits by 27,000 unique visitors, the majority of whom were in their 50s to 70s, the age range for which the assessment was clinically tested. Most importantly, 15,000 people completed the full 20-minute assessment and many returned to use the company’s other online resources. Baycrest, a Toronto-based academic health sciences centre that is developing and providing innovations in aging and brain health, founded Cogniciti in 2010 in partnership with MaRS. Cogniciti is quick to describe its test as a “thermometer” for memory health. Just as a thermometer can detect fever, encouraging its user to seek medical attention, Cogniciti’s test assesses memory, encouraging its user, when necessary, to do the same. The test is an early-warning indicator, not a diagnostic tool. Initially, the Cogniciti test was only promoted in Canada. However, it is available to Internet users anywhere, although fluency in English is required. 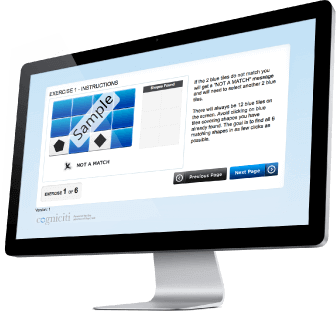 When users begin the test they are offered the opportunity to be automatically reminded to take the test again after a suitable length of time, such as a year. Regular testing with a standardized and validated test will prove invaluable for tracking any worrisome declines in memory performance over the years, sounding an alarm much earlier than otherwise might be the case. Disclaimer: MaRS holds a minority equity position in Cogniciti.